Friday I was out surfing at the west coast of Jutland. The prologue took place at a fully exposed beach with a nasty shore-break and ended by me flying and landing head first in the gravel. While I'm sure the beachwalkers found the incident amusing, I was happy for my helmet. The surfing continued at the Fish Factory where we had one super surf session. For once I found I was really able to control the my surf kayak, changing direction at will and getting some super long parallel runs. Last summer I got hold of a second-hand Lendal Kinetik Wing paddle and I've been using it ever since for surfing. As you might know the Kinetik is of a hybrid flat/wing design. It is supposed to be usable for the wing stroke and steering strokes. Before I give my verdict I have to shorten the paddle. One thing for sure - it lacks the bite and grip of my normal wing. I have once tested a Lendall Kinetic Wing. I didn't like it at all. It doesn't feel either like a regular wing or an euro paddle. I currently use Bracsa IV for sea kayaking. Last autumn I bought an Epic Mid Wing for fitness paddling and racing, after testing fellow paddler's Epic only once - I was sold. I would use an Epic for sea kayaking as well, if the reliability of the paddle would be as good as it's feeling on the water. The adjuster of the shaft has already broken once. I have heard that there will be a new adjuster available from August/September 2009 (http://www.epickayaks.com/tech/Length-Lock%202). I was able to make a new personal record 46.05 on our club's 9,5 km Wednesday race course with the Epic (average speed 12,4 km/h), so at least it hasn't slowed me down (that isn't very good time at all but I think it is still acceptable performance for a sea kayaker sitting in a sprint kayak). It would be interesting to participate TdG this year, but I'm afraid I can't do that. Next autumn, perhaps. Oh, I forgot that the photo reminds me something. I just few weeks ago performed the same, sitting in a fully loaded sea kayak and without wearing a helmet. I think I was extremely lucky not to hit my head on the bottom on the shallow water. 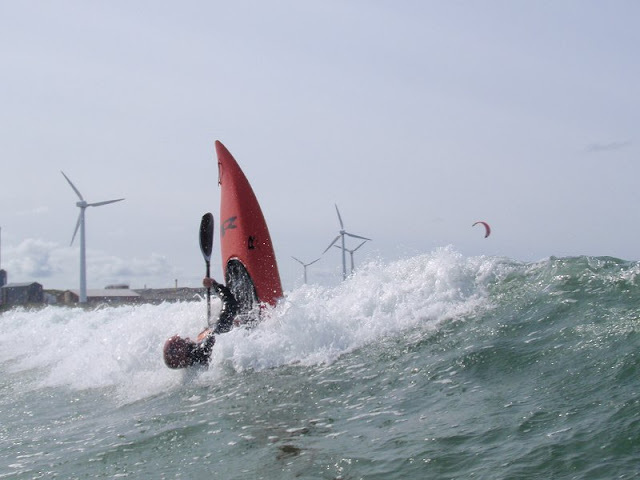 Nice and funny manouver with surf kayak, scary moment with loaded sea kayak. Hvor er dette sted pa kysten? Jeg bosoker Danmark men har aldri funnet noen surfkajaker? Er det mulig a leie en surf baat? Og sig så lige til resten af Paddle-Norge at det danske kajakforbund afholder kajaksurf-symposium i Vorupør d. 25-27 september og vi meget gerne ser norske deltagere. Waiting for your experiences of the Lettmann Warp paddle .. I'm very satisfied of the performance of my Epic Mid Wing. On the Finnish marathon championship I was able to paddle almost at full steam thanks to my trustworthy paddle, despite the fact that the conditions were somewhat difficult. Even the strongest guys were about 1 km/h slower than they should have been. At least three paddlers took a swim. I was seventh overall. This Wednesday I again made a new personal record 45.15 (avg speed 12.6 km/h) on our club's 9,5 km Wednesday race. I think that has something to do with my new paddle, as well as with the month-long training camp around Denmark .. I'm responsible for the race along with Jan Seremet, the winner of Sea Challenge Fyn 2009(Jan and I shaking hands at TdG http://aarhushavkajakklub.dk/php/coppermine/displayimage.php?album=70&pos=4 ). I expect a preliminary invitation sometimes in March available at the Canoe Federations homepage and I'll also mention it here. One nice property of the race is that we're already on location because of the surf symposium. So there'll be many kayakers in short surf kayaks playing and hopefully many racers on surfskis and in fast sea kayaks for the race saturday. While the race in 2010 is our first take on the concept I really have high hopes for the future. Yes we have lots of snow and ice now in Finland. Not very good thing for paddling, but excellent conditions for cross-country skiing. The best thing is that skiing is much more fun than kayaking indoors. I have paddled a kayak ergometer only once this winter. Looking forward to hear more about the race. Then I probably have to decide for which race (if any) I'll be able to come to Denmark, TdG or the Danish Downwind. Let's see.